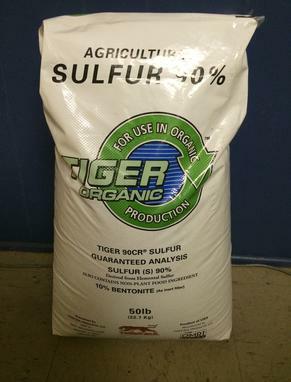 Water degradable sulfur combined with a special formulation of bentonite clay and wetting agents. This sulfur comes in a hard “pellet” that has the shape of a split pea. High sodium levels in the soil and/or soil sulfur deficiency. Modifies soil chemistry, aids in sodium leaching, and improves mineral uptake in high pH soils, especially phosphate and micronutrients.